combinations of both. 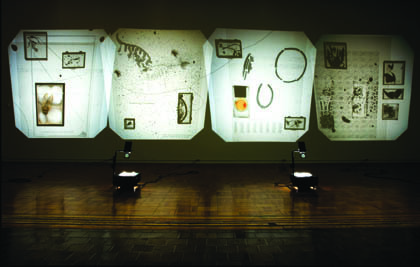 The action of collecting (mostly) organic objects form the basis of much of Paulʼs work, and visitors to the exhibition will encounter works of art that combine natural and organic materials such as bones, feathers, teeth, hooks, and small piles of carefully placed fragments with skillfully incorporated elements such as intaglio printing, computers, digital video, and overhead projectors. The resulting juxtapositions and combinations that result will be presented by the artists in a free, public lecture on Sunday, October 23 before the opening reception.